On Thursday, August 23, 2018, faculty, staff and administrators of SUNY Maritime College will come together for convocation to welcome in the 2018-19 academic year. It presents an opportunity to celebrate Maritime pride and achievement. In addition to kicking off the first year of implementation of the strategic plan, “Charting a New Course,” Maritime is pleased to welcome Clay Maitland, managing partner and owner of International Registries, Inc., who will serve as the keynote speaker. 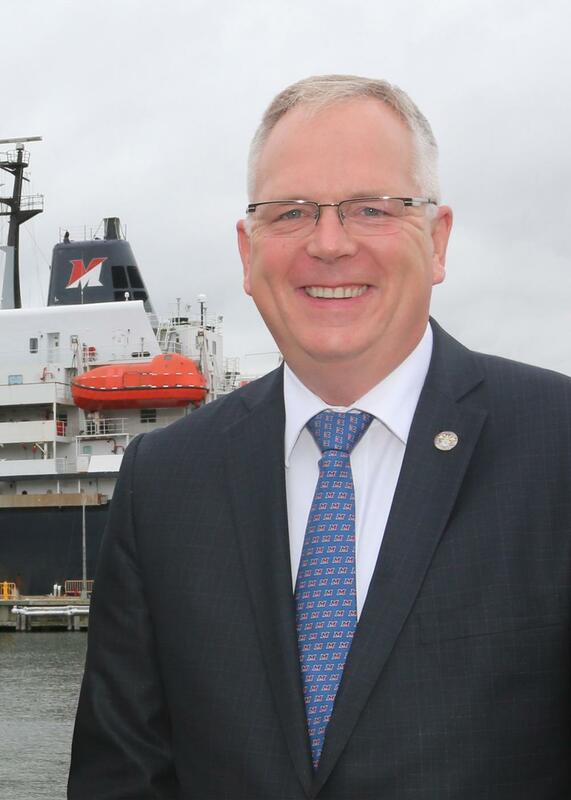 Dr. Michael A. Alfultis was named the 11th President of Maritime College by the SUNY Board of Trustees in June 2014 and appointed a Rear Admiral U. S. Maritime Service by the U.S. Department of Transportation Maritime Administration. A retired U.S. Coast Guard captain with 28 years of service, Dr. Alfultis taught at the U.S. Coast Guard Academy, and subsequently served as the director and chief administrative officer of the University of Connecticut’s Avery Point campus. Dr. Alfultis has more than 20 years of undergraduate teaching experience and 13 years of academic administrative responsibility at military and civilian institutions of higher education. His background includes service as an operations officer and navigator on a Coast Guard cutter; maritime safety and security; Coast Guard Academy faculty member and academic department chair; and senior administrator at a flagship university. Dr. Alfultis graduated from the Coast Guard Academy in 1982 with a degree in Marine Science. He has a Master of Science degree from the University of Washington and a doctorate from the University of Rhode Island, both in Oceanography. Clay Maitland, Managing Partner, International Registries, Inc.
Maitland, who received an honorary doctorate from SUNY Maritime in 2006, has worked in the shipping industry since graduating from law school in 1968. Having been employed more than 40 years at the Marshall Islands Registry, the third largest registry in the world, Maitland is uniquely qualified to discuss the state of the shipping industry today and what the industry needs from a 21stcentury maritime college. With the adoption of “Charting a New Course,” SUNY Maritime College is committed to meeting the demands of current and future employers by examining academic programs and graduating students with the adaptable skills necessary for an ever-changing workplace. The central themes of the strategic plan are: achieving new heights of academic excellence; empowering a Maritime College faculty for the future; cultivating strong external partnerships; championing diversity and inclusion; fostering vibrant student life; and realizing the college’s future. A longtime supporter of Maritime College and a leader of the maritime industry, Maitland is president of the Trust Company of the Marshall Islands, the statutory maritime administrator of the Republic of the Marshall Islands. He previously held similar positions with the Republic of Liberia. Maitland was decorated with the U.S. Coast Guard’s Distinguished Public Service Award in 2010 by the commandant of the Coast Guard, Adm. Robert J. Papp.